The immensely popular Adrian Mole diaries continue with Adrian Mole and the Weapons of Mass Destruction (ISBN 0-141-02177-2), published by Penguin Books in soft cover this year. Written by Sue Townsend, one of the UK’s most prolific authors, with now seven Adrian Mole diaries, plus other very well accepted books such as The Public Confessions of a Middle Aged Woman (Aged 55 3/4) and Number Ten, this latest Adrian Mole is a non-skimpy 460 pager. Sue Townsend has the rare ability to find every spark of humour in the otherwise mundane lives that we all live, to a greater or lesser extent. Credit card bills shoved in drawers unopened is one failing I will admit to. When you have not got the money to pay, why bother looking! Adrian Mole has this down to an art form. Adrian also has to run the gauntlet of a marauding swan named Gielgud, with Adrian writing in his diary, “I cannot stand this constant intimidation. Something will have to be done.” But you know Adrian will not be the person doing it! Other critics have compared this book to J. D. Salinger’s Catcher in the Rye, but for me there was also much of Keith Waterhouse’s Billy Liar, but where Billy attempted to act out his fanciful life, Townsend’s Adrian Mole just drowns in his! However, there is a much deeper side to Adrian Mole than there is to Billy. Adrian has the ability to show us the house of cards that we all hold up as our society, unable to make decisions that might cause the cards to fall over and force us to really examine our society and our place within it. The weapons of mass destruction are not rockets from Iraq that could reach the shores of Britain in 45 minutes, but are actually the framework of the current society, within which we live. 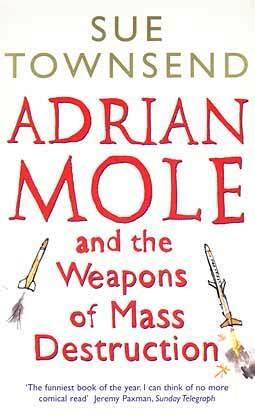 Adrian Mole did as his name suggests, just dug deep and hid. Perhaps President George Bush might have done better to have listened to Ms. Sue Townsend’s Adrian Mole, rather than his own advisors, while looking for the WMDs. At B. 350, it certainly would have been cheaper. And a better read. In 1969 keyboard wizard Vincent Crane and drumming sensation Carl Palmer left mid tour of The Crazy World of Arthur Brown’s debut American tour citing irreparable differences with the man himself, Arthur Brown, not perhaps the most thought through idea in Rock ‘n’ Roll, but sometimes a musician has to do what a musician does. Upon arrival back in England it was decided to put a band together around these two musicians; like-minded talents were then sought after, Brian Jones who had just left the Stones was due for a meeting with Vincent Crane the day before he was found drowned in a swimming pool; Rich Gretch was asked but had already hung his star to new super group “Blind Faith” with Eric Clapton, Steve Winwood, and Ginger Baker; Jack Bruce was asked as well but was determined to forge out a solo career, and when Bruce turned down the bass position John Paul Jones was singled out, but he was already in another heavy metal flyer called Led Zeppelin. But all these names do let your mind wander into all the different possibilities that could have happened. 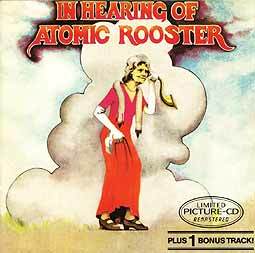 The newly branded Atomic Rooster was rolled out with its debut album ‘Atomic Rooster’ (1969) with the relatively unknown Nick Graham completing the trio on bass. The album met with great critical praise but little commercial success. The album is a bluesy affair with not much notice of the heavy rock carnage that was to come. Nick Graham promptly left, and Atomic Rooster never employed a bass player at any time in their following career, Vincent Crane preferring to play the bass notes on his Hammond organ rather than trust another fickle bass man. Followed by Carl Palmer who was lured away to be the “P” in another super group, Emerson, Lake, and Palmer. New recruits were sought and two new Roosters were found: John Ducann, on lead guitar, who brought along young skinsman Paul Hammond. Immediate success was to follow with the Rooster taking on the hard heavy metal of the day. In November of 1970 this trio’s first album was released “Death Walks Behind You” with its ground breaking Hammond organ sound from Vincent Crane, guitar thunder from Ducann, and powerhouse drumming from Paul Hammond. Further progress was made when the song ‘Tomorrow Night’ was plucked from the album as a single and reached the Top Ten. 1971 was to prove to be Rooster’s year, when they were right at the front of the heavy metal boom, alongside such luminaries as Deep Purple and Black Sabbath. A follow up single ‘Devil’s Answer’ was released and met with even greater success, reaching Number Two. Whilst in the studio recording this album it was decided to expand the line-up to four with the addition of a vocalist, and the services of ex-Cactus lead singer Peter French were employed, an excellent choice. French’s vocals were laid down so late in the day the artwork for the album had already been done, so his head had to be painted onto the inside artwork at the last minute. The album “In The Hearing Of” was released in September 1971 and went straight into the Top Twenty. The music is not quite as heavy as that of its predecessor, but that does not mean it has lost any of its aggression or grit. Vincent Crane’s Hammond organ is not so much in evidence with the piano being used to great effect on a lot of the songs. This is spelled out right from moment go when the Rooster strut their stuff on opener ‘Breakthrough’, with Cranes hammering piano dominating the song as it pushes its way into your subconscious. ‘Breakthrough’ is the perfect opener for this finely selected collection of hard rockin’ classics. Of the nine songs on this album (Hit Single ‘Devils Answer’ has been tacked on the end of the original eight album tracks as a welcome bonus) two are instrumentals, only five are sung by new vocalist Pete French, Vincent Crane takes lead vocals on the dark and broody ‘Black Snake’, whilst ‘Devil’s Answer’ features the vocals of John Ducann, having been recorded before Pete French’s arrival. Six songs were written by Vincent Crane, three by John Ducann. One song, ‘Decision/Indecision’, does not even require the services of Ducann’s guitar work, with Crane supporting French’s emotional vocals on solitary piano, a haunting piece to be sure. Pete French gives a great display as a vocalist on his limited opportunities, but it is perhaps the two rockin’ instrumentals, ‘A Spoonful Of Bromide Helps The Pulse Rate Go Down’ and ‘The Rock’ that would have most pleased the fans from the previous album. It is the only time during the album that both Vincent Crane and John Ducann actually let go and give it some clout. ‘In The Hearing Of’ was a great follow up to ‘Death Walks Behind You’.